Whether you’re a rich chocolate or cool espresso hue, bring out your best brunette with Grow Gorgeous 12-in-1 Cleansing Conditioner Brunette. The hair’s added shine reflects the light to enhance the color of your brunette tresses for unbelievably glossy locks. Injecting moisture and thoroughly cleansing each and every strand of hair is achievable with this miracle multi-tasker that adds shine and volume while keeping frizz and flyaways at bay. Gentle enough for daily use, this sulphate-free formula adds incredible volume and helps hair health for longer, stronger hair and a brilliant brunette shine. Hair Type: Brunette hair (natural or colored) in need of volume, strength and shine. 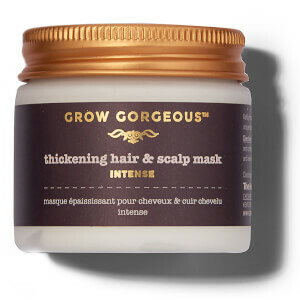 Add a generous amount to wet hair, massaging into scalp before smoothing through to ends. As our Cleansing Conditioners are sulphate-free you won’t experience much of lather from the product, don’t be alarmed, it’s still working. Rinse thoroughly, while continuing to massage hair and scalp, to reveal gorgeous hair. Aqua (Water), Palmitamidopropyltrimonium Chloride, Propylene Glycol, Crambe Abyssinica Seed Oil, Parfum (Fragrance), Glycol Distearate, PPG-3 Caprylyl Ether, Ethylhexyl Stearate, Hydroxyethylcellulose, Tremella Fuciformis Sporocarp Extract, Panthenol, Sodium Methyl Cocoyl Taurate, Glycerin, Betaine, Sodium Chloride, Potassium Sorbate, Caramel, Calcium Sodium Borosilicate, Iron Oxide Red (CI 77491), Tin Oxide (CI 77861), Phenoxyethanol, Chlorphenesin, Alpha-Isomethyl Ionone, Linalool, Limonene, Butylphenyl Methylpropional, Hydroxyisohexyl 3-Cyclohexene Carboxaldehyde. Seriously, never stop selling this! I originally bought this product from Ulta Beauty, but haven’t been able to find it there for a long time now. I’m so glad I found your website! I love the cleansing conditioner! I have curly hair that’s kinda fine, but I have a TON of hair. This stuff smells amazing, gives me the moisture I need, and doesn’t weigh my hair down. I hardly ever have to use any hair product after washing my hair with this, and it makes my hair so shiny. My hair feels so healthy when I use it, which can be a hard thing to accomplish with curly hair. I hope I never have to find a replacement for this stuff, or I might cry. Great product! Don’t get desperate, the first weeks are difficult but it’s worth it, my hair never felt so good in my life. I bought this product as a recommendation from a friend who said this was supposed to be really good. It turns out it is awfull, at least for my hair. It leaves my hair with residue, like it never washes off, it feels heavy and greasy and dirty...I don’t know how it can be great for some people and have a completely diferent effect on other people, like myself. Wish it would have said on the package which types of hair it suits, as clearly it’s not for everyone. I have thin wavy dark non-coloured "European" type of hair with some bay-hair around the face. I am looking for products that improve the condition of hair so it looks thicker. This product washes hair genlty but hair feels heavy and it clumps, so I could only go 1 day/wash. Normally I can do 2. Condition nicely, smells gorgeous but it weighs down the hair. WOW!!! Must have . . .
First thing is I completely disagree with the comment about this product leaving residue on your scalp/hair.. this may suit some people and may not suit others for sure. For me, this product is beautiful! I have been using it for 3 weeks now and I have never EVER loved my hair more! It is luxurious to touch, it blow drys quickly without leaving my hair parched, it smells devine and people comment on how shiny it is all the time now. This was a complete fluke to find and WOW am I glad that I tried it! I'll never use traditional shampoo and conditioner ever again. I love having gorgeous hair and this product makes it so, very aptly named!!! I'm a huge fan! First time you use this product, your hair turns out soft, clean and gorgeous. Second wash, ditto, if feeling a little heavy. Third wash, it'll be like you haven't even washed your hair. I think it works differently for different hair types--mine is fine and thin. On that third wash, I've found Grow Gorgeous leaves too much gunk behind, so I instead I'll use a clarifying apple cider vinegar shampoo to wash it all out. Then, I start the process all over again-- two shampoos with Grow Gorgeous, one with ACV. So there's a learning curve if you want good results.